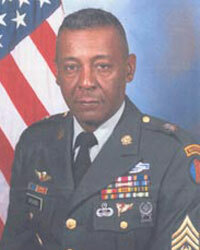 CSM Eugene Spencer was born 6 July 1939 in Columbus, Ohio, and raised in Detroit, Michigan. Most recently he was residing in Dahlonega, Georgia. During his 30 year military career, he served in the Republic of Vietnam with the 2nd BN, 8th CAV (Airborne) and the 1st CAV DIV. He served two tours in Panama and one tour in Alaska. His stateside duties were: Senior Drill Sergeant at Ft Gordon, Georgia; Intelligence SGT (NCOIC) of 1st BN/75th INF, Hunter Army Airfield, Georgia, 45th Co TSB, Fort Benning, Georgia; Operations SGT with HHC, 1st 503rd, Fort Campbell, Kentucky; and HHC, 75th Inf Reg. He served as the CSM of HHC, 4/327th and commandant of the NCO Academy in Ft Richardson, Alaska, and Bde CSM of the 2nd BT Bde and 4th BT/AIT Bde, Fort Jackson, South Carolina. CSM Spencer's miliatray schooling included USASMA Class 21; ANCOC; NCOA; Drill Sergeant's School; Pathfinder; Ranger; Airborne; Recondo; Canadian Jump School; Jumpmaster; AASLT School; JOTC; ITC; BTMS (EXT) and PLC. His military awards include the Legion of Merit; Army Service Medal; Republic of Vietnam Gallantry Cross with Palm; National Defense Service Medal w/ Bronze Star; Presidential Unit Citation (Army-Air Force); Valorous Unit Award; Overseas Service Ribbon w/Num3; NCO Professional Development Ribbon w/Num4; Good Conduct Medal w/2nd OLC; Bronze Star Medal; Humanitarian Service Medal; Meritorious Service Medal; Vietnam Service Medal w/3 Service Stars; Republic of Vietnam Campaign Medal; Pathfinder Badge; Master Parachutist Badge; Overseas Service Bar; Ranger Tab; Drill Sergeant ID Badge; Air Assault Badge; Combat Infantryman Badge; Parachutist Badge, Canadian. CSM Spencer was of the Catholic faith and a member of the Masonic Lodge Electric City of Columbus, Georgia. He died on 2 October 1992 in Dahlonega, Georgia.